Mircea Eliade’s writing on comparative religion has had a profound impact on Neo-Paganism, not to mention religious studies generally. He is the author of Cosmos and History: The Myth of the Eternal Return (1954), The Sacred and the Profane (1957), and Patterns in Comparative Religion (1958). Eliade introduced a whole new vocabulary to the study of religion, and many of these concepts made their way into Neo-Pagan, like the “axis mundi“, the symbolic center of the world that is often represented in myth and ritual as a great World Tree or sacred pole. Eliade’s study of shamanism (1964) was also critical in the development of Neo-Shamanism, which influenced Neo-Paganism as well. Another important concept of Eliade’s which influenced Neo-Paganism was the “Eternal Return”. The Eternal Return is one religious response to what Eliade called “the terror of history”, the anxiety produced by our consciousness of our finitude, an anxiety which produces either denial or nihilism in the modern mind. The Abrahamic religions of Judaism, Christianity, and Islam, respond to this anxiety by sacralizing linear history, which is envisioned as a series of episodes in the continuous revelation of God progressing toward a culmination in a messianic age or last judgment. In the Dharmic religions of Hinduism, Buddhism, and Jainism, time is cyclical, not linear, but this cycle is perceived, not as something sacred, but as as something to be escaped. The Eternal Return is a third response to the terror of history. It is the response of what Eliade calls “cosmic religion”, which includes Paleolithic religions as well as Neo-Paganism. In contrast to the monotheistic religions with their linear view of sacred time and the progressive nature of history leading to a final eschcatological event, Neo-Pagans view sacred time as cyclical, rotating between life and death in an eternal cycle of periodic renewal, which Eliade calls “the eternal return”. Neo-Pagans visualize time not as a straight line, but as a circle or as a spiral (a combination of cyclical and linear time). The cyclical nature of existence reflected in the movement of the sun, the moon, and the stars, the changing of the seasons, the life cycle of plants and animals, and in our own biological and spiritual lives. In contrast to the Dharmic religions, which seek escape from this cycle, Neo-Pagans embrace it. Far from being a source of pessimism or despair, for Neo-Pagans, the ineluctability of death gives deeper meaning to existence. According to Robert Ellwood and Harry Partin, Neo-Paganism is “a new cosmic religion oriented to the tides not of history but of nature — the four directions, the seasons, the path of the sun — and of the timeless configurations of the psyche.” Mircea Eliade defines a “cosmic religion” as one which in which religious activity is centered around the mystery of the periodic renewal of life in the cycle of birth, death, and rebirth, manifested in the rhythms of nature and symbolized in the myths of deities who die and return to life. Neo-Pagans believe in a dialectic continuity or complementarity of life and death. 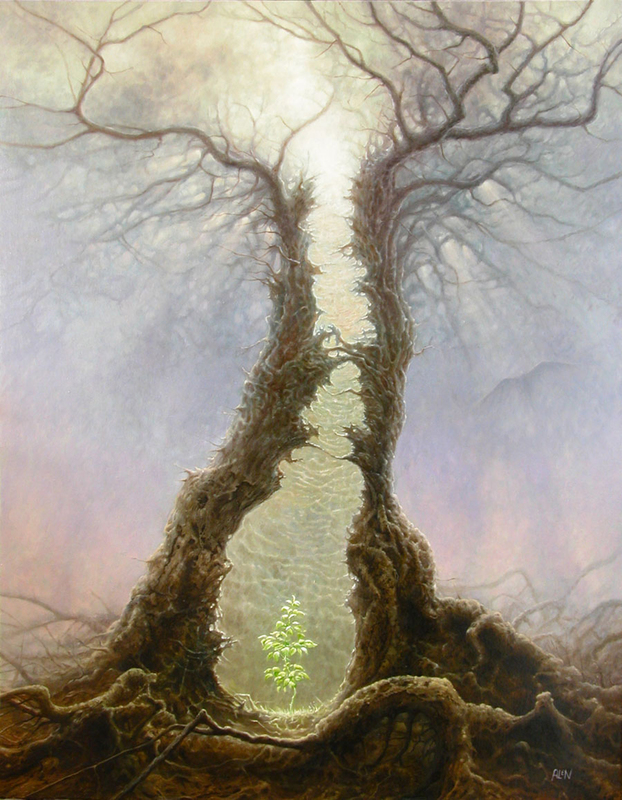 One of the most important insights of the Neo-Pagan metaphysic is that new life depends on death, and that death can only be conquered by accepting it and being reborn. Joseph Campbell calls this palingenesis, the “eternal recurrence of birth”. He writes that all truly creative acts derive from some sort of dying. “When our day is come for the victory of death,” writes Campbell, “there is nothing we can do, except be crucified—and resurrected; dismembered totally, and then reborn.” This truth is manifested on both the cosmic and personal levels. On the cosmic cycle, we see it in the passage of the sun and the seasons. On the personal level, it is reflected in both the biological life-cycle as well as the psychological “deaths” that we must endure in order to be reborn to a fuller life. This principle is also expressed mythologically in the form of the Neo-Pagan Goddess. Unlike the omni-beneficent God of monotheistic religions, the Neo-Pagan Goddess is both creative and destructive, the one aspect necessitating the other. This is expressed in the aphorism, “The tomb is the womb, and the womb is the tomb”, which refers to the Goddess as both the ground or source of life and its ultimate destination. I tend to think of the Cycles as more of a helix, after all our planet and sun are not stationary, but are orbiting the center of the Milky Way Galaxy like everything else hereabouts. Perhaps an oddly shaped helix (to a theoretical outisde observer), given the plane of the ecliptic’s angle to the galaxy’s orientation, but a helix nonetheless.